It appears the universe noticed my bah-hum-buggy self the other day after my post about there being no rum balls this year. And so I have to thank the universe for noticing my lack of holiday happiness and then providing so many opportunities for me to fix that issue of mine. First I got invited to a cookie exchange party this Saturday. Then I got invited to a virtual cookie exchange party. It’s almost as if the universe wants me to bake cookies, eat cookies, and buy new pants! The things I do for the universe. 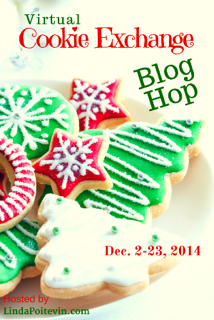 I was tagged by my dear friend and fellow writer, Kerry Schafer, to participate in a virtual cookie exchange. When I offered up a wee bit of a balk over the whole thing, she very gently reminded me that “everyone has a cookie recipe” which was precisely the kick in the pants I needed to find my holiday mojo. Because while I may not have my cherished box of Christmas recipes, I do have the internet and after this virtual cookie exchange, I’ll have a whole passel of new recipes to try out. For instance, Kerry shared with us her recipe for “Melting Moments” which sound like something I might do after a few of Mister Soandso’s fortified egg nogs. Seriously, the recipe sounds yummy and super easy. And I could convince myself that they are healthy based on the oatmeal, right? I, myself, am sharing a recipe that may not be healthy in any way other than its potential to bring about world peace. These are my favorite morsels of joy to have with an afternoon cup of coffee. Pinky-swears, they are delicious. Dorie Greenspan’s recipe for World Peace Cookies is all over the internet, but as far as I’m concerned, a person can’t have too many links to deliciousness. And in case you are link-adverse, I’m posting it (with some minor adjustments) below. Preheat oven to 325 degrees. Line baking sheets with either silpat or parchment. Using a mixer, beat the butter on medium speed until soft and creamy. Add both sugars, the salt and vanilla extract and beat for 2 minutes more. Turn off the mixer. Pour in the dry ingredients, drape a kitchen towel over the stand mixer to protect yourself and your kitchen from flying flour and pulse the mixer at low speed about 5 times, a second or two each time. Take a peek — if there is still a lot of flour on the surface of the dough, pulse a couple of times more; if not, remove the towel. Continuing at low speed, mix for about 30 seconds more, just until the flour disappears into the dough — for the best texture, work the dough as little as possible once the flour is added, and don’t be concerned if the dough looks a little crumbly. Toss in the chocolate pieces and mix only to incorporate. Using a sharp thin knife, slice the logs into rounds that are 1/2 inch thick. (The rounds are likely to crack as you’re cutting them — don’t be concerned, just squeeze the bits back onto each cookie.) Arrange the rounds on the baking sheets, leaving about 1 inch between them. Excerpted from Baking: From My Home to Yours by Dorie Greenspan (Houghton Mifflin, 2006). Copyright 2006 by Dorie Greenspan. Now, I realize that not everyone enjoys chocolate quite the way I do. (Gasp.) So just in case you aren’t inspired to bake cookies after Kerry or my recipes, I am tagging 4 other folks who will post their recipes next Tuesday (12/16). You’ll also notice that in Kerry’s post, she tagged 4 folks as well, as well as the originator of this gastric goodness, Linda Pointevin. All in all, there will be lots of cookies being shared so get your link-click on and then get baking. Because any day with cookies in it is a good day! Okay, here’s my four dear cookie bakers. I promise you, you are in for a treat with these folks so check their blogs on December 16th for deliciousness! The extent of my love for Doctor Who is large, very large. I suppose it is somewhat more accurate to say my love of Doctor Who is great and my fan-girl love of former Doctor Who David Tennant is even greater. My husband knows of this and isn’t terribly worried. After all, I’m a middle-aged lady in the US…how likely is David Tennant to even notice my existence, much less leave his fantastically adorable brand-new wife…for moi? Slimmer than my thighs, that’s for sure. And besides, Mister Soandso has his own thing going for the ladies of Who, starting with Billie Piper. I can’t blame him, but what in the name of all things Maybelline were they thinking with that mascara?